4345 ∆ 9a 3 Kr. Rose, fresh colors and good margins on piece with clear, full mounted two line cancel \"small postal agency REICHELSDORF\", outstanding quality! 4346 ∆ 9a 3 Kr. 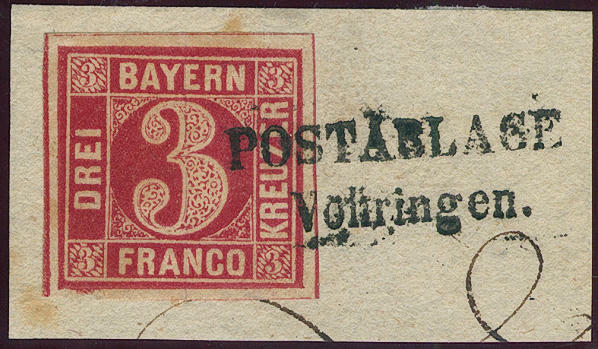 Red, fresh colors, on all sides having full to wide margins, tiny patina, on piece with clear two line cancel \"small postal agency VOLTRINGEN\". 4347 ✉ 9a 3 Kr. Rose, wonderful having bright colors and on all sides piece in outstanding quality with enormous margins with pricked clear two line cancel. Small postal agency \"NEUENDETTELSAU\" and additional likewise clear semicircle cancel \"abbey HEILSBRONN 29 / 3\" on very nice white cover with arrival postmark on the back \"ANSBACH\". A fantastically beautiful letter for your highest requirements! 4348 ∆ 10 6 Kr. 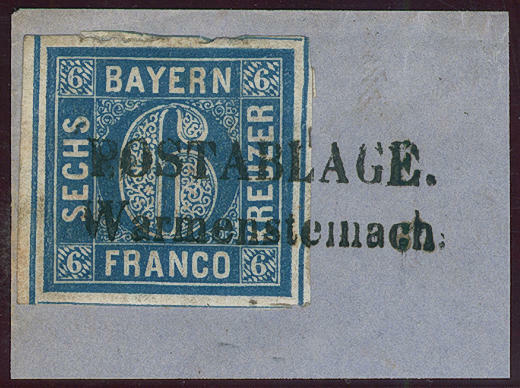 Blue, fresh colors, on all sides having full to wide margins, three sided with intermediate lines on piece with clear two line cancel \"small postal agency WARMENSTEINACH\", superb in every respect (choice copy). 4349 ⊙ 10a 6 Kr. 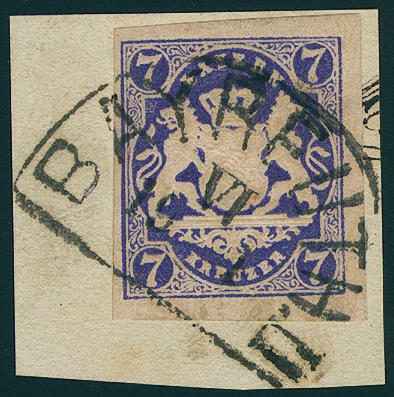 Blue, having bright colors, on all sides wide to having enormous margins outstanding quality with parts of three neighbour stamps and all four cut lines, as well clean mounted open millwheel postmark \"91\", outstanding quality! 4350 ✉ 10a 18 Kr. 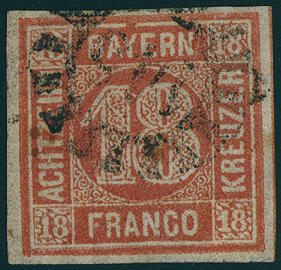 Vermilion, fresh colors and on all sides good margins in perfect condition on decorative cover with open millwheel postmark \"28 (AUGSBURG) \" and additional rectangle cancel \"PD\", as well two ring cancel \"AUGSBURG 4. 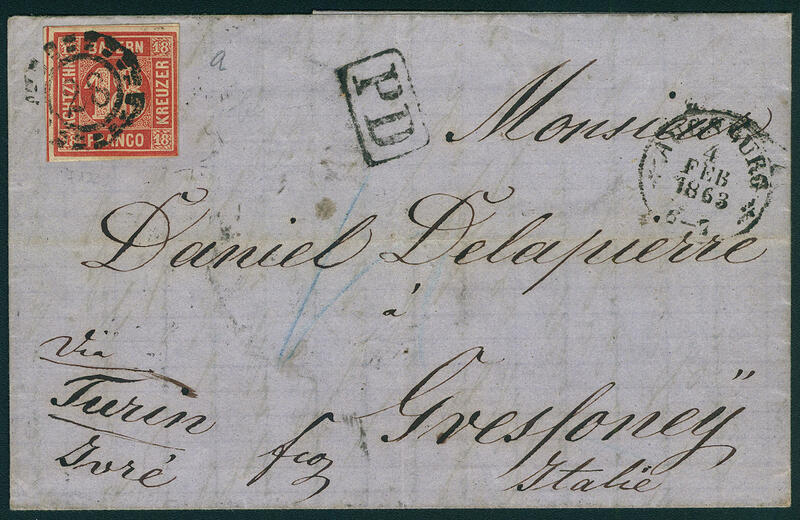 February 1863\" with handwritten routing indicator \"VIA TURIN\" to Gresfoney / Italy. 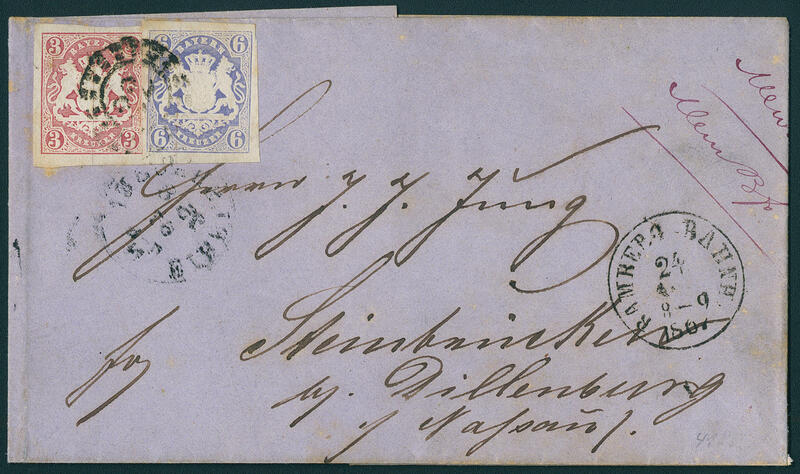 A very nice, faultless single franking the sought-after 18 Kr. Photo expertize \"in perfect condition\" Sem BPP. 4351 ⊙ 12 12 Kr. Yellow green, having bright colors, on all sides piece in outstanding quality with enormous margins with clean mounted railway cancel (TPO), expertized Brettl BPP. 4352 ∆ 12 12 Kr. 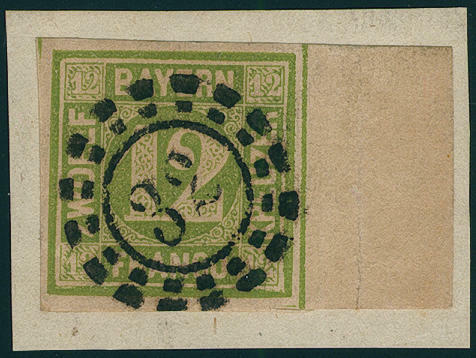 Light green, wonderful having bright colors and on all sides piece in outstanding quality with enormous margins with large right margin of sheet on magnificent white letter piece with pricked clear closed millwheel postmark \"32\". An outstanding quality for your highest requirements! Expertized Brettl BPP. 4353 ∆ 12 12 Kr. 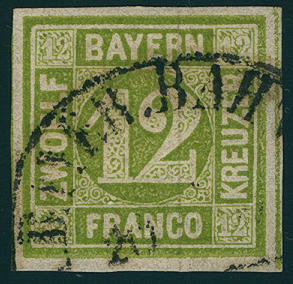 Dark yellow green, having bright colors, on all sides piece in outstanding quality with enormous margins on beautiful letter piece with clean mounted open millwheel postmark \"288\". 4354 ✉ 12 12 Kr. 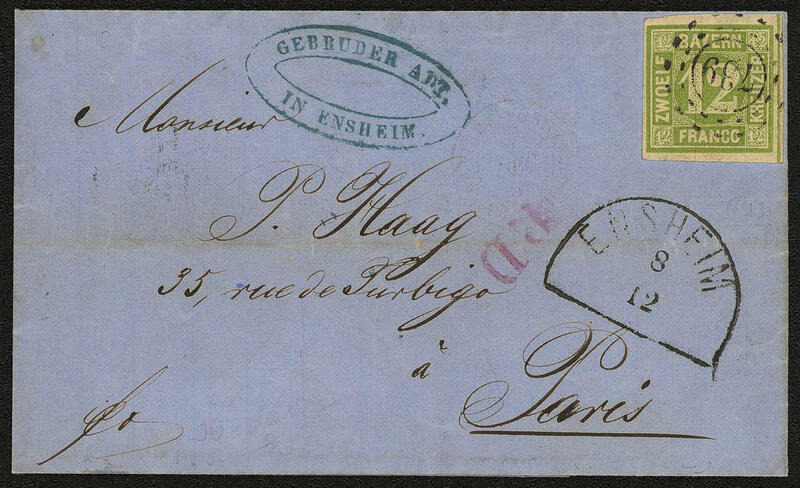 Green, having bright colors, on all sides full to piece in outstanding quality with enormous margins on very nice cover with open millwheel postmark \"739\" and additional clear semicircle cancel \"ENSHEIM 8.12. 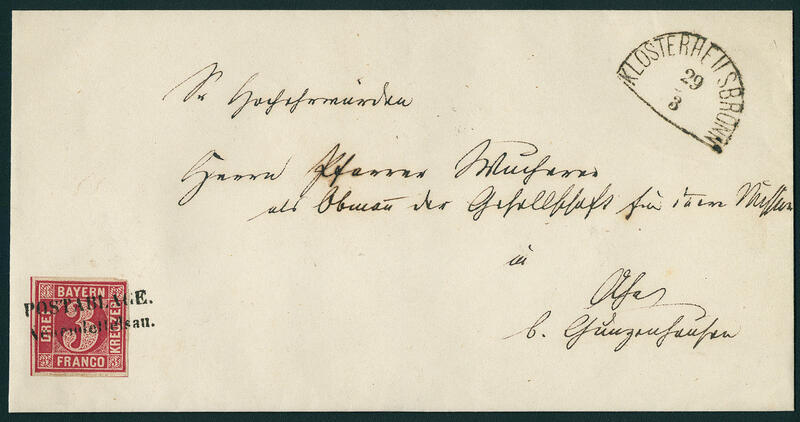 (1862) \" to Paris, expertized Brettl BPP. 4355 ⊙ 13a 18 Kr. 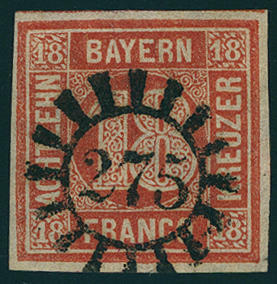 Vermilion, wonderful fresh colors and excellent margins with an especially beautiful, razor-sharp mounted closed millwheel postmark \"275\", expertized Schmitt BPP. 4356 ∆ 13a 18 Kr. Vermilion, having bright colors, on all sides full to wide margins extremely fine copy with number postmark \"28\" on piece, expertized Brettl BPP. 4357 ⊙ 13b 18 Kr. Orange red, the good colour, fresh colors and on all sides good margins with closed millwheel postmark \"145 (FÜRTH) \", superb in every respect (choice copy), photo expertize \"faultless condition\" Brettl BPP. Michel 600,- €. 4358 ⊙ 15 3 Kr. 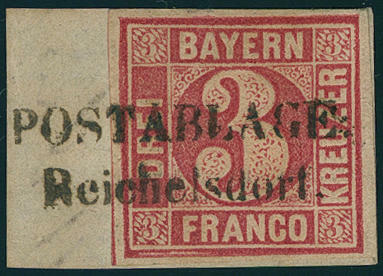 Rose, horizontal strip of four, fresh colors and with wide margins with clean mounted single circle postmark \"Nuremberg railway station 29. June 70. \". Outstanding quality! 4359 ∆ 15 3 Kr. 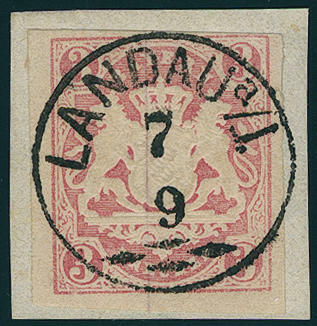 Rose, wonderful having bright colors, on all sides full- to piece in outstanding quality with enormous margins with all perfect, centric and straight mounted adornment single circle postmark \"LANDAU 7 / 9\". A piece of dream for your highest requirements! 4360 ∆ 15 3 Kr. 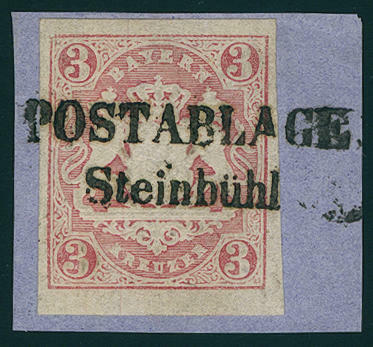 Rose, having bright colors outstanding quality on very nice letter piece with clear and full mounted two line cancel \"small postal agency STEINBÜHL\", signed Horst Krause. 4361 ✉ 15,16 3 Kr. Rose, 6 Kr. 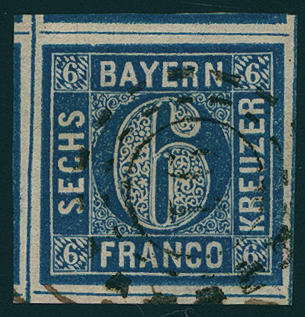 Pale blue, both values fresh colors and with wide margins on cover with open mill wheel cancel \"32\" and additional single circle postmark \"BAMBERG railway station 24.8.67. \", small patina, to Stone bridges. 4362 ✉ 21b 7 Kr. 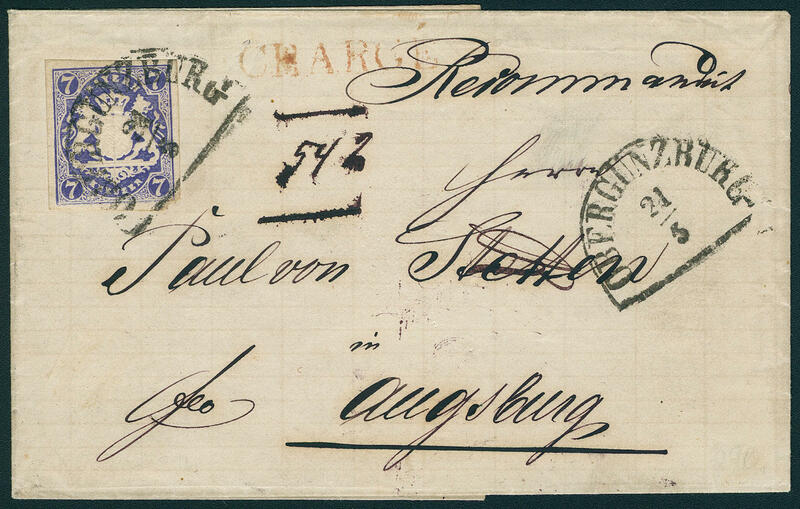 Dark ultramarine, having bright colors and piece in outstanding quality with enormous margins on very nice registered cover with semicircle cancel \"OBERGÜNZBURG 21.5. 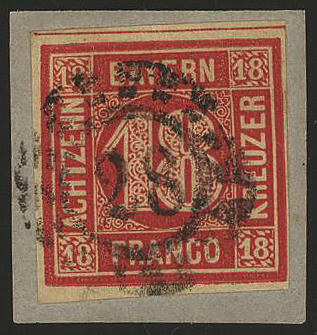 (1869) \" to Augsburg, expertized Brettl BPP. 4363 ∆ 21d 7 Kr. Cornflower blue, wonderful fresh colors and large margins all around on very nice white letter piece with clear semicircle cancel \"BAYREUTH\". An outstanding quality of this rare colour for the highest standards! Photo expertize \"faultless condition, an especially nice copy\" Brettl BPP. 4364 ∆ 21dIV 7 Kr. 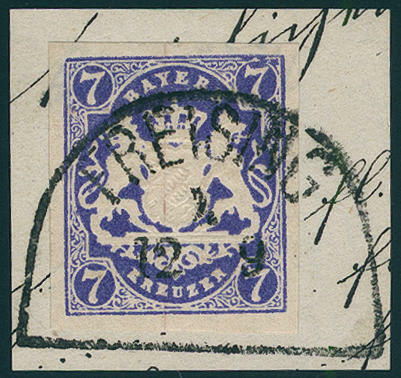 Royal blue, the scarce colour with plate flaw \"circle about right upper numeral of value 7 multiple damaged\", fresh colors and large margins all around on very nice white letter piece with full and straight mounted clear semicircle cancel \"FREISING 12.9. \". 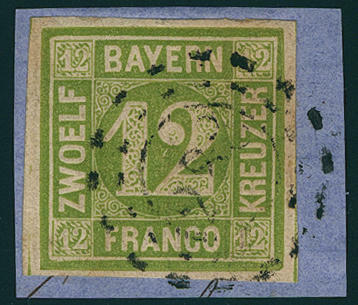 A beautiful copy and as use the good colour with the plate flaw from utmost rarity. Photo expertize \"the condition is in perfect condition\" Brettl BPP.